Anti Gimmick Health: Let the Sun Shine In! If you are not sunbathing on a regular basis, you are probably not as healthy as you could be. I bet that got your attention! Yeah, I know. I've heard all the reports and seen all the headlines too. For as long as I can remember, we have been told, through blaring headlines or news reports, to avoid the sun at all cost. Never go out in the sun without suncreen of at least SPF15. Wear long sleeves, hats etc...to protect our skin from the harmful rays of the sun. We are led to believe that we are all a sunny day away from dying of skin cancer. That has always bothered the crap out of me! I didn't have any real scientific reason for my aggravation, it just didn't seem to make any sense to me that God, (the universe, Ra, Yahweh, Mother Earth, the god of your understanding, _______________. (Not crucial to the point.)) would have that thing show up every day, and hang around for twelve hours or so, just to have us avoid it. I'll pause momentarily, while you stand in awe at my great intellect. Ok. Pick up your jaw. I've got to move on. Now, that said, I'm no idiot. I've spent two days lying on a sofa because I couldn't walk due to the tops of my feet being sunburned. It only took one time experiencing that to learn that those "puppies" get slathered in SPF100 if I'm going to be out at the beach, but I never bought in to the idea that my everyday exposure to the sun and even an occasional near naked bask in her warmth (mental picture) was likely to kill me. Much to the chagrin of my adult offspring, as usual, Dad was proven to be right! The science is pouring in like rainfall on a pup tent. It turns out that most of us don't get enough of what the ancient Egyptians called Ra. We are sun deprived! It would seem that the fear mongers are a 180 degrees out of phase. It is estimated that a large percentage of us suffer from Vitamin D deficiency, and don't even know it. Space does not allow here to discuss the most recent research on this amazing hormone, but suffice it to say that evidence mounts indicating it's importance to bone and teeth health, cancer prevention, obesity, insulin regulation, blood pressure, immune system and on and on. Now, without getting into the weeds about the science, it all boils down to this. The best source of Vitamin D is the sun. 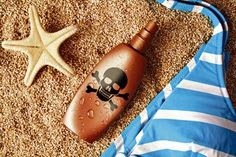 Our skin reacts to the rays of the sun by producing the hormone we call Vitamin D. Therefore, it is important that we expose ourselves to the sun regularly, sans sunscreen, and preferably in a swimsuit, Warning: This is in brief periods, 15-30 minutes before applying sunscreen, but use common sense. A sunburn is never a good idea. Not all of us live in areas where weather allows year round sun exposure. This, combined with the fact that it is very difficult to get sufficient quantities of Vitamin D from our food, makes it necessary to take a vitamin D supplement. I'm quoting from Nutrisearch Comparative Guide to Nutritional Supplements by Lyle MacWilliam. "A 2006 review of vitamin D status and cancer risk in the northeastern United States concluded that efforts to improve vitamin D status through vitamin D supplementation could markedly reduce cancer incidence and mortality at low cost and with few or no adverse effects. A 2008 review of current research findings on the cancer-protective effects of vitamin D concluded that intakes of between 1000 and 4000 IU per day protect against cancers of the breast, colon, prostate, ovary, lungs and pancreas." I encourage you to do your own research, but for your health's sake, don't just read this and forget about it. Sunshine is still free and a quality vitamin D supplement is relatively inexpensive.